RDGLDGRN (pronounced red gold green) have already distinguished themselves in the DC music scene. Their highly stylized sound (that Go Go drum beat- a distinct DC rhythm) takes hip-hop infused punk and indie rock to create something refreshingly unique, is getting attention from fans stretching far beyond the DC niche scene. 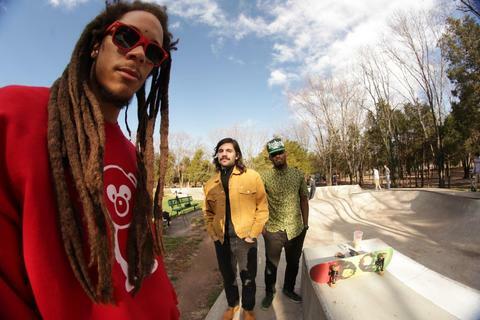 Comprised of three members who identify as Red, Gold, and Green, RDGLDGRN began making music in their basement studio, drawing from a vast and almost ironically diverse pool of influences like Chuck Brown, Vampire Weekend, Outkast, The Neptunes, and Bad Brains. What many might consider a wildly ambitious, even impossible task to pull off, RDGLDGRN managed to effortlessly combine genres of music to create something new, something all their own, and something that has the music industry buzzing with excitement. The band gained widespread recognition when they self-released a song called “I Love Lamp” on YouTube- a way for friends and local fans to listen to their music. They had no idea that within just a few weeks, the video would have over 100,000 views and the attention of many notable figures both in the industry as well as on the blogosphere. Producer Kevin Augunas (Edward Sharpe and the Magnetic Zeros, Cold War Kids) quickly took notice of the band, and in addition to producing RDGLDGRN’s debut, also signed them to his label, Fairfax Recordings (Gotye, Tribes) in a joint venture with Universal Republic Records. Upon entering the legendary Sound City Studio in Van Nuys, CA, a studio where Fleetwood Mac recorded ‘Rumours’ and Nirvana recorded ‘Nevermind’, RDGLDGRN were fortunate enough to have captured the attention of Nirvana alum, Foo Fighters front man, and hometown hero, Dave Grohl who recorded drums on the entire album. It wasn’t just rock royalty that took notice of RDGLDGRN, the hip-hop community was also taken by the band’s unique sound. Genre-bending artist, producer, and designer, Pharrell Williams (N.E.R.D., The Neptunes), co-wrote and co-produced the standout track “Doing the Most”, lending his distinct style to one of the most unique tracks on the album that showcases Green’s undeniable talent for rapping and singing infused with Pharrell’s style of unusual beats and musical wit. The result is a debut that truly demonstrates the group’s ability to straddle genre lines, to combine musical polarities and unite both artists and fans over music that’s multifaceted. However, it’s not the musical intricacies, or the obscure combination of influences, that make RDGLDGRN who they are. It’s their ability to create something entirely fresh and new, something that’s often overlooked in this state of the industry where musicians try to stay afloat by following trends. If you ask RDGLDGRN who their biggest influences are, they’d tell you the Beatles and Bob Marley. And while RDGLDGRN don’t exactly sound like those legendary artists, they do share in common something less tangible- they all have made it a point to carve their own path by creating something entirely unique.